Denisova Cave (Russian: Дени́сова Пеще́ра, translit. Denisova peshchera, lit. 'the cave of Denis'; Altay: Аю-Таш, translit. Ayu Tash, lit. 'Bear Rock') is a cave in the Bashelaksky Range of the Altai mountains, Siberia, Russia. The cave is of great paleoarchaeological and paleontological interest. Bone fragments of the Denisova hominin originate from the cave, including artifacts dated to around 40,000 BP. A 32,000 year old prehistoric species of horse has also been found in the cave. The cave is located in a region thought to have been inhabited concurrently in the past by Neanderthals and modern humans. A bone needle dated to 50,000 years ago was discovered at the archaeological site in 2016 and is described as the most ancient needle known. Denisovans, Neanderthals and related hybrids may have inhabited the Denisova Cave for extended periods, but perhaps not at the same time. Located in Altai Krai, near the border with Altai Republic, both in Russia, the cave is near the village of Chorny Anui (Чёрный Ануй), and some 150 km (93 mi) south of Barnaul, the regional capital. The cave, which is approximately 28 m (92 ft) above the right bank of the Anuy River (a left tributary of the Ob), has formed in upper Silurian limestone and contains a floor area of about 270 m2 (2,900 sq ft). The cave is composed of three galleries. The central chamber, the Main Gallery, contains a floor of 9 m × 11 m (30 ft × 36 ft) with side galleries, the East Gallery and the South Gallery. It has been described both as a karst cave and as a sandstone cave. Cave sediments are rich with remnants of animals, including extinct ones. Remains of 27 species of large and medium-sized mammals have been found, (such as cave hyena, cave lion, etc.) and 39 species of small mammals, as well as remnants of reptiles, 50 bird species and other vertebrates. Pollen in the cave sediments is used for palaeoclimatological research. 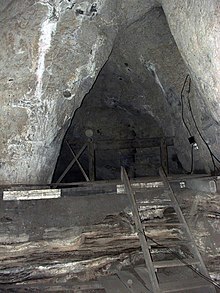 In the 18th century, the cave was inhabited by a hermit, Dionisij (Denis), and was named after him, while the indigenous Altay people call it Ayu-Tash (Bear Rock). In the 1970s, Soviet scientists discovered paleoarcheological remains in the cave that led to further explorations. So far, 22 strata have been identified, with archeological artifacts that cover the time from Dionisij back to about 125,000–180,000 years ago. The dating of the strata was accomplished by the use of thermoluminescence dating of sediments, or, in some cases, radiocarbon dating on charcoal. Among the archeological artifacts are Mousterian- and Levallois-style tools attributed to Neanderthals. Beside tools, researchers found decorative objects of bone, mammoth tusk, animal teeth, ostrich egg shell, fragments of a stone bracelet made of drilled, worked, and polished dark green chloritolite, and pendants. A seven-centimetre (2.8 in) sewing needle made from bird bone, estimated to be around 50,000 years-old, was found in Denisova Cave. 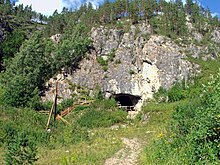 The cave also contains stone tools and bone artifacts made by modern humans, and Pääbo commented: "The one place where we are sure all three human forms have lived at one time or another is here in Denisova Cave." Denisovans, Neanderthals and related hybrids, may have inhabited the Denisova Cave over thousands of years, but it is unclear whether they ever shared the cave. The average annual temperature of the cave remains at 0 °C (32 °F), which has contributed to the preservation of archaic DNA among the remains discovered. Scientists from the Institute of Archaeology and Ethnology of Novosibirsk have investigated the cave. Among the artifacts which had been left about 30,000 to 48,000 years ago (strata 9–11), bones were identified. One of these bones was a piece of phalanx of a child found in layer 11.2 of the East Gallery. The fossil element was analyzed by Svante Pääbo and coworkers from the Max Planck Institute for Evolutionary Anthropology in Leipzig; its mitochondrial DNA revealed a structure that differs from known human patterns and has been ascribed to "Denisova hominin", apparently an extinct hominin species or subspecies. Further analysis revealed the Denisovans were related to the Neanderthals and interbred with the ancestors of modern Melanesians. In 2010, a toe bone was discovered in the cave, in layer 11.4 of the East Gallery, and therefore contemporary with the Denisovan finger bone. Preliminary characterization of the bone's mitochondrial DNA suggested it belonged to a Neanderthal, not a Denisovan. Later analysis confirmed the toe bone as coming from a Neanderthal. 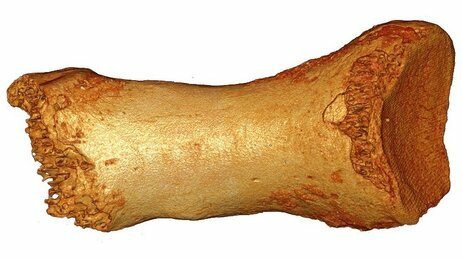 The first high-coverage genome of Neanderthals was taken from this toe bone. This Neanderthal is referred to as the Altai Neanderthal. The Altai Neanderthal is estimated to be around 120,000-year-old. Other Neanderthals for which nuclear DNA has been recovered are all genetically closer to each other than to the Altai Neanderthal. Modern humans and Ust'-Ishim man share more alleles with all other Neanderthals than with the Altai Neanderthal, which shows that the introgression event from Neanderthals into humans likely took place after the split of the lineage of the Altai Neanderthal from that of other Neanderthals. The use of collagen peptide mass fingerprinting of ancient bone samples, so-called Zooarchaeology by Mass Spectrometry (ZooMS), for species identification allowed the sorting of 2,315 unidentified bone fragments from 2012 or 2014 excavation. One sample, DC1227 (Denisova 11), taken from layer 12 of the East Gallery, carried human traits. This was the first time that this technique was used to successfully identify the presence of an extinct human. DC1227 was a bone fragment weighing 1.68 g (0.059 oz), measuring in with a maximum length of 24.7 mm (0.97 in) and maximum width of 8.39 mm (0.330 in). Further analysis showed the bone fragment to have Neanderthal mitochondrial DNA (mtDNA). Whole genome sequencing and other characterization of Denisova 11 to 2.6-fold coverage showed this specimen belonged to a female at least thirteen years old at the time of death. Denisova 11 was found to be the hybrid progeny of a Neanderthal mother and a Denisovan father. Comparing the entire genome against all archaic hominin genomes on record, Denisova 11 shares the most genetic affinity with Denisova 3, indicating that her Denisovan father is more closely related to Denisova 3 than her mother was to any of the sequenced Neanderthals. Like Denisova 3, this father carries some introgressed Neanderthal DNA from an admixture event far in the past, estimated at more than 300 generations earlier, and similar in sequence to the Altai Neanderthal genome. However, the mother of Denisova 11 was genetically closer to Neanderthal specimen Vindija 33.19 from Vindija Cave in Croatia and to other sequenced Neanderthal individuals than to the Altai Neanderthal. This suggests a migration or population turnover involving the Neanderthal populations of the region surrounding the Denisova cave. Sequencing of DNA from soil samples taken from Denisova Cave showed the presence of Neanderthal and Denisovan mtDNA from several samples, as well as the DNA of several animals. Neanderthal mtDNA was present in soil samples from layer 15 of the Main Gallery, a layer associated with Paleolithic artifacts where no Neanderthal fossil have been found. Neanderthal and Denisovan mtDNA were present in samples from layers 14 and 15, respectively, from the East Gallery, lower than any previous fossil finds. MtDNA has also been recovered from an equid fossil, dating to around 32,000 years ago, taken from Denisova Cave. The equid fossil was identified as coming from Equus ovodovi (Ovodov horse), an extinct species first described based on a 40,000 year old fossil taken from Proskuryakova Cave in Khakassia, Russia. The mtDNA of the Denisova sample shows close affinity for that taken from Proskuryakova Cave. DNA analysis places Equus ovodovi as a phylogenetically basal group for non-caballine horses, with closest genetic affinity with zebras. So far, the fossils of six distinct individuals from Denisova Cave have been identified through their DNA. Four of the individuals, Denisova 2, Denisova 3, Denisova 4 and Denisova 8 are classified as Denisovans. Denisova 2 and Denisova 3 are young girls, while Denisova 4 and Denisova 8 are adult males. mtDNA analysis of the Denisovan individuals suggests that Denisova 2 is the oldest, followed by Denisova 8, while Denisova 3 and Denisova 4 are roughly contemporaneous. One of the individuals, the Altai Neanderthal, is a Neanderthal woman. Before its DNA was sequenced, the Altai Neanderthal had been given the provisional name of Denisova 5. In 2018, Denisova 11 was identified as a Neanderthal/Denisova hybrid, based on whole genome sequencing and comparisons. During DNA sequencing, Denisova 2, Denisova 4 and Denisova 8 yielded low-coverage genomes, while Denisova 3 and the Altai Neanderthal yielded high-coverage genomes. Team of Michael Shunkov Johannes Krause, et al. Destroyed to investigate the mtDNA. ^ Anatoly P. Derevianko; Alexander V. Postnov; Eugeny P. Rybin; Yaroslav V. Kuzmin; Susan G. Keates (2007). "The Pleistocene peopling of Siberia: A review of environmental and behavioural aspects". Bulletin of the Indo-Pacific Prehistory Association. 25. pp. 57–68. Archived from the original on 25 December 2016. Retrieved 18 March 2018. ^ a b Zimmer, Carl (30 January 2019). "High Ceilings and a Lovely View: Denisova Cave Was Home to a Lost Branch of Humanity - The mysterious Denisovans may have occupied a cave in what is now Siberia for more than 250,000 years". The New York Times. Retrieved 31 January 2019. ^ a b Slon, Viviane; Hopfe, Charlotte; Weiß, Clemens L.; Mafessoni, Fabrizio; de la Rasilla, Marco; Lalueza-Fox, Carles; Rosas, Antonio; Soressi, Marie; Knul, Monika V.; Miller, Rebecca; Stewart, John R.; Derevianko, Anatoly P.; Jacobs, Zenobia; Li, Bo; Roberts, Richard G.; Shunkov, Michael V.; de Lumley, Henry; Perrenoud, Christian; Gušić, Ivan; Kućan, Željko; Rudan, Pavao; Aximu-Petri, Ayinuer; Essel, Elena; Nagel, Sarah; Nickel, Birgit; Schmidt, Anna; Prüfer, Kay; Kelso, Janet; Burbano, Hernán A.; Pääbo, Svante; Meyer, Matthias (2017). "Neandertal and Denisovan DNA from Pleistocene sediments". Science. 356 (6338): 605–608. Bibcode:2017Sci...356..605S. doi:10.1126/science.aam9695. ISSN 0036-8075. PMID 28450384. ^ a b c d e Hirst K K. "Denisova Cave (Siberia).Altai Mountain Paleolithic Site of Denisova Cave". Retrieved March 24, 2010. ^ a b c "Денисова пещера. Denisova-Denisova Cave-Denis Cave". Retrieved March 24, 2010. ^ "Шуньков М. В, Агаджанян А. К. Палеография палеолита Денисовой пещеры. 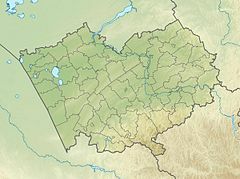 Археология, этнография и антропология Евразии. 2000.- No. 2 (2).- pages 2–20". Retrieved March 28, 2010. ^ "Denisova Cave – abode of Denisova hominins, Wondermondo". Retrieved March 28, 2010. 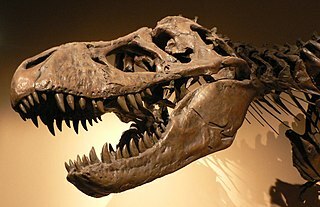 ^ a b Rex Dalton (March 24, 2010). "Fossil finger points to new human species. DNA analysis reveals lost relative from 40,000 years ago". Nature. 464 (7288): 472–73. doi:10.1038/464472a. PMID 20336101. ^ a b Gibbons, Ann (August 2011). "Who Were the Denisovans?" (PDF). Science. 333 (6046): 1084–87. doi:10.1126/science.333.6046.1084. PMID 21868646. Archived from the original (PDF) on 9 July 2013. Retrieved 9 July 2013. ^ Carl Zimmer (22 December 2010). "Denisovans Were Neanderthals' Cousins, DNA Analysis Reveals". NYTimes.com. Retrieved 22 December 2010. ^ a b c d Prüfer, Kay (2013). "The complete genome sequence of a Neanderthal from the Altai Mountains". Nature. 505 (1): 43–49. Bibcode:2014Natur.505...43P. doi:10.1038/nature12886. PMC 4031459. PMID 24352235. ^ Hajdinjak, Mateja; Fu, Qiaomei; Hübner, Alexander; Petr, Martin; Mafessoni, Fabrizio; Grote, Steffi; Skoglund, Pontus; Narasimham, Vagheesh; Rougier, Hélène; Crevecoeur, Isabelle; Semal, Patrick; Soressi, Marie; Talamo, Sahra; Hublin, Jean-Jacques; Gušić, Ivan; Kućan, Željko; Rudan, Pavao; Golovanova, Liubov V.; Doronichev, Vladimir B.; Posth, Cosimo; Krause, Johannes; Korlević, Petra; Nagel, Sarah; Nickel, Birgit; Slatkin, Montgomery; Patterson, Nick; Reich, David; Prüfer, Kay; Meyer, Matthias; Pääbo, Svante; Kelso, Janet (2018). "Reconstructing the genetic history of late Neanderthals". Nature. 555 (7698): 652–656. Bibcode:2018Natur.555..652H. doi:10.1038/nature26151. ISSN 0028-0836. PMID 29562232. ^ a b c d Slon, Viviane; Mafessoni, Fabrizio; Vernot, Benjamin; de Filippo, Cesare; Grote, Steffi; Viola, Bence; Hajdinjak, Mateja; Peyrégne, Stéphane; Nagel, Sarah; Brown, Samantha; Douka, Katerina; Higham, Tom; Kozlikin, Maxim B.; Shunkov, Michael V.; Derevianko, Anatoly P.; Kelso, Janet; Meyer, Matthias; Prüfer, Kay; Pääbo, Svante (2018-08-22). "The genome of the offspring of a Neanderthal mother and a Denisovan father". Nature. 561 (7721): 113–116. doi:10.1038/s41586-018-0455-x. ISSN 0028-0836. PMC 6130845. PMID 30135579. ^ a b c d Brown, Samantha; Higham, Thomas; Slon, Viviane; Pääbo, Svante (March 29, 2016). "Identification of a new hominin bone from Denisova Cave, Siberia using collagen fingerprinting and mitochondrial DNA analysis". Scientific Reports. 6: 23559. Bibcode:2016NatSR...623559B. doi:10.1038/srep23559. PMC 4810434. PMID 27020421. ^ a b c "Novel collagen fingerprinting identifies a Neanderthal bone among 2,000 fragments". University of Oxford. University of Oxford. Mar 29, 2016. Retrieved 1 April 2016. ^ a b c Warren, Matthew (22 August 2018). "Mum's a Neanderthal, Dad's a Denisovan: First discovery of an ancient-human hybrid - Genetic analysis uncovers a direct descendant of two different groups of early humans". Nature. 560 (7719): 417–418. doi:10.1038/d41586-018-06004-0. PMID 30135540. ^ Druzhkova, Anna S.; Makunin, Alexey I.; Vorobieva, Nadezhda V.; Vasiliev, Sergey K.; Ovodov, Nikolai D.; Shunkov, Mikhail V.; Trifonov, Vladimir A.; Graphodatsky, Alexander S. (2017). "Complete mitochondrial genome of an extinct Equus (Sussemionus) ovodovi specimen from Denisova cave (Altai, Russia)". Mitochondrial DNA Part B. 2 (1): 79–81. doi:10.1080/23802359.2017.1285209. ISSN 2380-2359. ^ a b c d e f Slon, Viviane; Viola, Bence; Renaud, Gabriel; Gansauge, Marie-Theres; Benazzi, Stefano; Sawyer, Susanna; Hublin, Jean-Jacques; Shunkov, Michael V.; Derevianko, Anatoly P.; Kelso, Janet; Prüfer, Kay; Meyer, Matthias; Pääbo, Svante (2017-07-01). 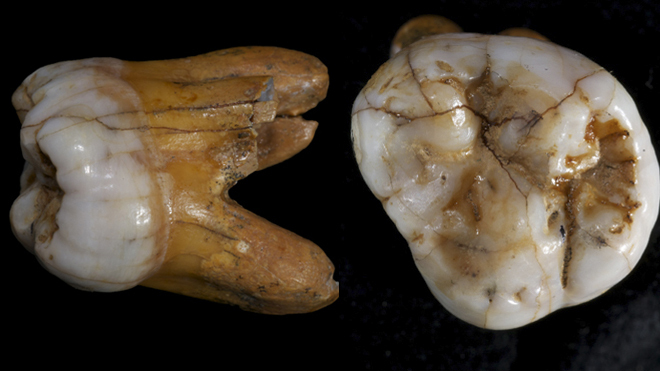 "A fourth Denisovan individual". Science Advances. 3 (7): e1700186. Bibcode:2017SciA....3E0186S. doi:10.1126/sciadv.1700186. ISSN 2375-2548. PMC 5501502. PMID 28695206. ^ a b c d Sawyer, Susanna; Renaud, Gabriel; Viola, Bence; Hublin, Jean-Jacques; Gansauge, Marie-Theres; Shunkov, Michael V.; Derevianko, Anatoly P.; Prüfer, Kay; Kelso, Janet; Pääbo, Svante (11 November 2015). "Nuclear and mitochondrial DNA sequences from two Denisovan individuals". PNAS. 112 (51): 15696–15700. Bibcode:2015PNAS..11215696S. doi:10.1073/pnas.1519905112. PMC 4697428. PMID 26630009. Retrieved 16 November 2015. ^ Krause, Johannes; Fu, Qiaomei; Good, Jeffrey M.; Viola, Bence; Shunkov, Michael V.; Derevianko, Anatoli P.; Pääbo, Svante (2010). "The complete mitochondrial DNA genome of an unknown hominin from southern Siberia". Nature. 464 (7290): 894–97. Bibcode:2010Natur.464..894K. doi:10.1038/nature08976. ISSN 0028-0836. PMID 20336068. ^ Ewen Callaway (22 December 2010). "News: Fossil genome reveals ancestral link: A distant cousin raises questions about human origins". Nature. 468 (1012): 1012. Bibcode:2010Natur.468.1012C. doi:10.1038/4681012a. ISSN 0028-0836. PMID 21179140. ^ Picture of the actually molar of Denisova. ^ M.B. Mednikova (March 2011). "A proximal pedal phalanx of a Paleolithic hominin from Denisova cave, Altai". Archaeology, Ethnology and Anthropology of Eurasia. 39 (1): 129–38. doi:10.1016/j.aeae.2011.06.017. ^ Pedal phalanx, actually fossil. Peștera cu Oase is a system of 12 karstic galleries and chambers located near the city Anina, in the Caraș-Severin county, southwestern Romania, where some of the oldest European early modern human (EEMH) remains, between 37,000 and 42,000 years old, have been found.